Vintex Shipping Phils. Corporation was given an interim MLC 2006 SRPSP certificate by ClassNK after the initial 1st stage audit on the company’s application for ISO9001:2008 and MLC 2006. On July 25, 2013, Vintex Shipping Phils. Corporation was awarded with Certificate of Quality Management Systems Registration by ClassNK following its 2nd stage audit which was conducted on July 3, 2013 at its principal office. The Quality Management System of the company met the Society’s Rules and in compliance with the standards of ISO9001:2008, and has been entered into register. 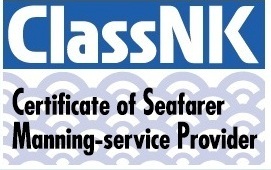 Moreover, the full term Certificate of Seafarer Recruitment and Placement Service Providers was also awarded in conformance with the ClassNK Standards and applicable requirement of the MLC 2006 and provisions of Declaration of Maritime Labour Compliance. It is our goal to be your long time partner in land and in the seas. Vintex Shipping Phils. Corporation has a Quality Management System duly certified by Class NK in Crew Manning Services, and is a Seafarer Recruitment and Placement Service Provider compliant on the standards of Maritime Labour Convention (MLC) 2006.